Two of the world’s great financial regimes are diverging. Not the Chinese and the Americans — these are converging. Rather, the regimes of the West and the Islamic world. And you’ll have to forgive me for preferring the Islamic model. This remains the basic position of the Catholic Church, albeit with some modification. It did not even take monotheism to recognize that usury was wrong. Aristotle saw it as being against the natural law and lumped usurers in with “those who ply sordid trades, pimps and all such people.” And despite the anti-Semitic trope that Jews have a tendency to lend money, the Old Testament is skeptical at best (Exodus 22:25). Usury is not just haram under Sharia Law. It is haram under most serious systems of moral philosophy and theology. Sounds pretty good, doesn’t it? Equity-financing seems like a model for the sort of rugged capitalism that Americans favor. Perhaps it is. But it is the Islamic world that is moving in this direction with their ban on usury, whereas America is moving more and more toward debt-financing instead. In the past 25 years, the number of stocks listed on U.S. stock exchanges has fallen by about half. 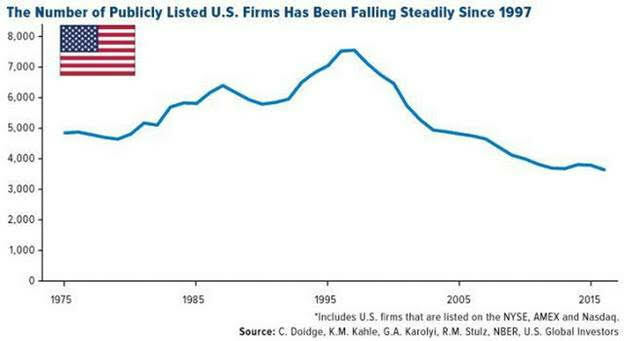 The number of companies launching on public markets has fallen. The following chart shows this. In addition to this, companies that are already listed are buying their shares back. Interestingly, they do this by borrowing in the debt markets. What they are doing is swapping equities for debt. They borrow from Peter to buy their stock back from Paul. The result is that there is more debt in the markets and less equities. See the following chart. According to American Affairs, Goldman Sachs estimated that $1 trillion would be spent on stock buybacks in 2018. 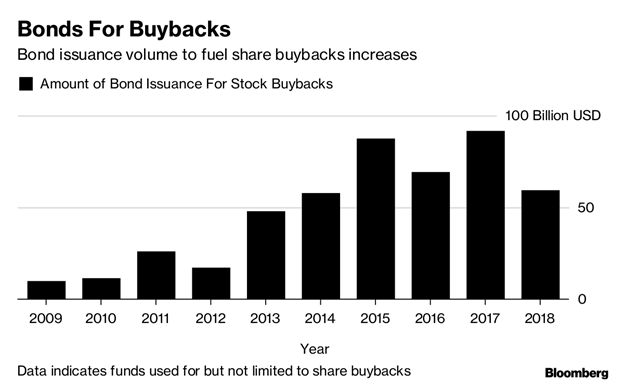 Much of the corporate windfall from Trump’s tax cut has gone into stock buybacks as well. What we are seeing is the American economy – together with the economies of many other non-religious countries – becoming less and less reliant on ownership by the public through the stock market. Fewer and fewer people have a stake in American capitalism. 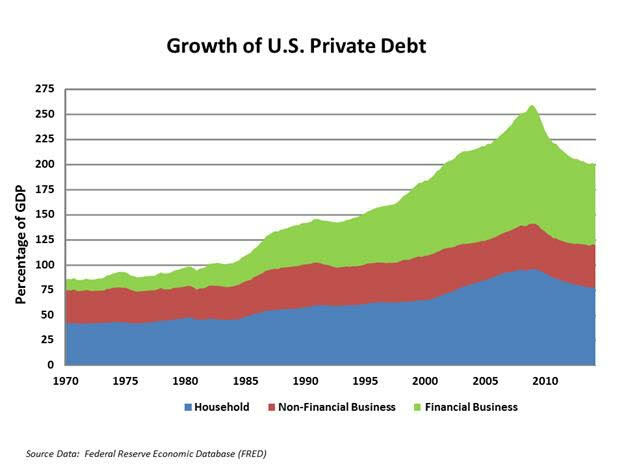 At the same time as the market for equities shrinks, the market for debt skyrockets. American capitalism is becoming American usury. Maybe this is what all those great moral philosophers and theologians had in mind when they said that we should be wary of money-lending? The irony of ironies, of course, is that the Islamic world is the one offering a better alternative, with a system of finance that encourages equity ownership and discourages large build-ups of debt. In this respect, at least, Sharia law is as American as apple pie. On a deeper level though, this is not that surprising. Islamic countries are, for the most part, the only ones that take their religious principles seriously enough to allow them to inform their structure of laws. The countries of the West used to do so, but increasingly politicians shy away from moral judgements, instead falling back on utilitarian arguments. They talk about ‘maximizing economic growth’ or raising the GDP. Maybe the old philosophers and theologians were wiser than our new administrator-politicians. Maybe they saw something much deeper and, in their skepticism of usury, recognized a timeless moral truth – one that can and should be applied to government. In 1515 Pope Leo X wrote that usury “is not a sin because it is prohibited; rather it is prohibited because it is in itself sinful, for it is contrary to natural justice.” Perhaps he knew something that we didn’t. A finance industry insider was consulted for this article, who wishes to remain anonymous.